“Oh, look.” Pardal sailed off of his elderly, spectacled host and to the other chair on the opposite side of the small table, where sat a pot of tea and a mostly consumed plate of biscuits with strawberry jam. Alighting on the chair’s arm, he watched Mr. Nigel, an aged and respectable gopher, comforting his wife Mrs. Nigel, who was sobbing onto his shoulder. “I’m sure it will be quite alright. These things have a way of working themselves out.” Mr. Nigel gently patted his wife on her back. “It’s quite well, my friend. I’m sure I’ll be able to get to sleep eventually once we reach home.” The genteel Mrs. Nigel peeked out of her shoulder of husband’s waistcoat to address their feathered companion. “What’s that? What’s that?” The sparrow fluttered back up to the dragon’s chair and perched on one side of the back. “What’s that title I see?” He stared intensely at the book which was resting on the dragon’s abundant lap. 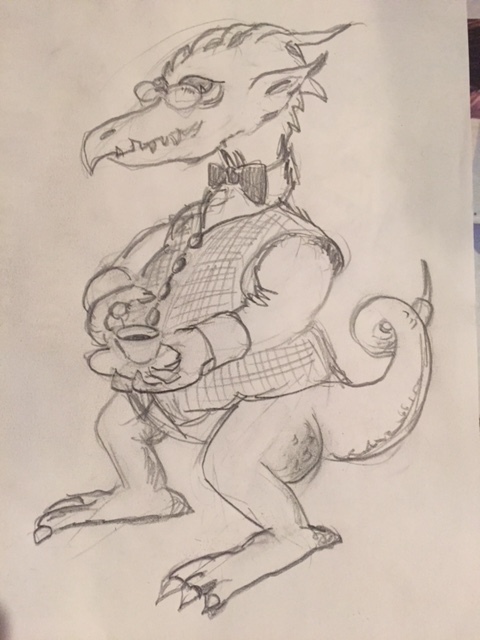 Gerliliam removed a cloth from his breast pocket and used it to clean the lenses of his spectacles, then returned the kerchief and replaced the glasses upon his long, scaled snout. “The title, as I’ve told you all before, is ‘The Children’s March: A Tale of the Dragon’s Children. '” Isn’t it sufficiently descriptive?” The grey, old serpent reached for his tobacco purse and pipe, and prepared to have a smoke. “Well, of course. I never said there wasn’t.” Seeing that his friends would not quiet down easily, the dragon put down his unlit pipe and tobacco slipper on the table next to the plate, shaking the plate and teapot, and making the snake jump. The energetic bird had to leap up quickly as he saw the dragon lifting his bulk out of the heavily cushioned chair. Gerliliam turned and plodded (he was tired, for it was somewhat late in the evening, and even old dragons need their rest) to the abundantly filled-to-overflowing bookshelves situated to the right of the door. There, he found a space between two tomes at about eye level, and put back the book he had just finished reading aloud to his closest companions. Previously, when Paris Davidson had visited some months ago, it displayed only the numeral “1” on its spine instead of the full title now displayed. Then the dragon extended a single claw onto the book next to it. As four pairs of eyes eagerly watched, he began to pull it out, and they all noted that on the spine there was merely the numeral “2”. Taking the book and resuming his seat, Gerliliam opened the cover to the first page. Although not based on today’s #writephoto prompt by Sue Vincent, because I’ve used her prompts to craft most of the first draft of this novel, I thought I’d include the epilogue as a bonus story. Let me know what you think. There be dragons in your stories today. There are dragons in a lot of my stories about the Davidsons. Actually, I’m planning a trilogy, but first I have to do all the stuff necessary to get book one published. I thought it was cool that as things were happening to the Davidsons, they were “automagically” being written in the book that the dragon was reading to his friends. Very interesting epilogue. I like it. And, of course, the hint (more than a hint) of a Part 2 and possibly more. This works very well with the rest of it even if in a very different tone. It’s sort of a set of bookends, since the book begins with Gerliliam’s house and includes his reading to his guests in the library and then ends the book there. There may be readers who “invest” in Gerliliam and his friends in the early chapters and I wanted to give them some “closure” and the promise that they aren’t totally out of the Davidson children’s lives. I thought it was fun. Very endearing.